On the 25th (Mon), pause for some serene contemplation at Pielpajarvi Wilderness Church, then head outdoors with Lake Inari, and then take in the architecture and atmosphere at Saint Tryphon Pechenga Orthodox Church. Keep things going the next day: relax in the rural setting at Inari Reindeerfarm, then get into the urban bustle at The Sami Cultural Centre Sajos, and then examine the collection at Siida. For maps, other places to visit, photos, and other tourist information, read our Inari online attractions planner . Geneva, Switzerland to Inari is an approximately 15-hour flight. You can also drive. The time zone difference when traveling from Geneva to Inari is 1 hour. Plan for colder temperatures traveling from Geneva in February, with highs in Inari at -6°C and lows at -15°C. Cap off your sightseeing on the 26th (Tue) early enough to go by car to Saariselka. 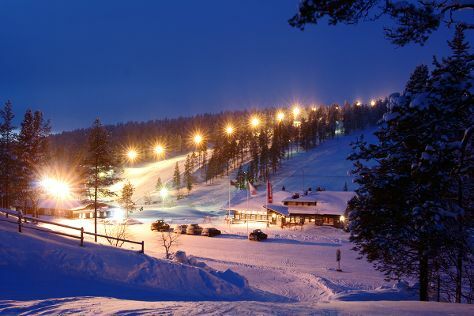 On the 27th (Wed), spend an exhilarating day on the slopes at Saariselka Ski & Sport Resort. For photos, more things to do, other places to visit, and tourist information, you can read our Saariselka trip itinerary planner . Drive from Inari to Saariselka in an hour. Alternatively, you can take a bus. Expect a daytime high around -6°C in February, and nighttime lows around -15°C. You'll set off for home on the 2nd (Sat).